Tracks are currently being laid in the midst of a Bedouin-inhabited Saudi Arabian desert landscape for the construction of the ‘Mecca AVE’, a high-speed rail project linking the cities of Mecca and Medina. In addition to the almost 500-km-long Haramain high-speed railway being implemented by a Spanish consortium, British studio, Norman Foster, is involved in the construction of stations for the four stops planned along the route: Medina, Mecca, Jeddah and King Abdullah Economic City (KAEC). 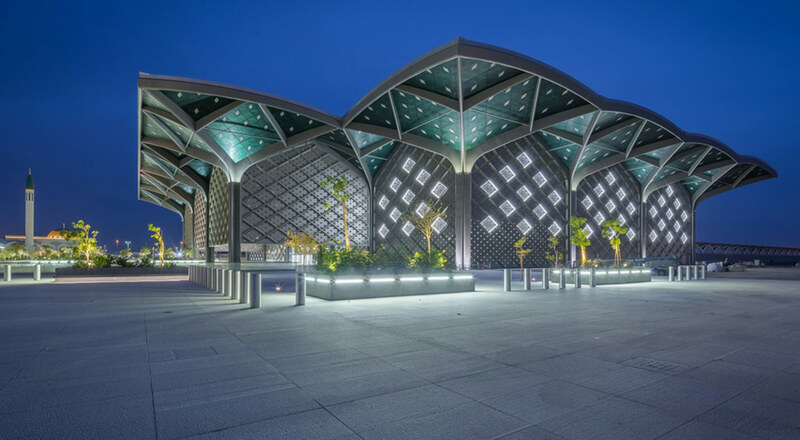 All the stations, still under construction, have a similar design based on a sequence of 25-metre-high arches, giving a modern twist to this traditional Arabic style. The main variation between the buildings is produced through different colours which identify each city: Medina takes the green of the Prophet’s Mosque; Mecca assumes the gilding of the Kaaba (Islam sacred pilgrimage site); Jeddah draws on its cultural links to the colour purple; and KAEC combines blue and silver to represent modernity. In addition to the colour, each of the buildings will have a slightly different facade tailored according to aspect and the incidence of the sun’s rays, either featuring shutters, glazing or a solid frontage. One element common to all will be the domed roof canopies, which will be supported by independent, branched structures that repeat in a 27-metre-square grid formation. Each station is oriented according to the sunlight, so the Medina structure will face towards the east, while that of Mecca will be north-facing. The changing position of the sun is articulated through openings in the roof that animate the space during the day and create the impression of stars in the sky at night. The stations will collectively cover an area more than 30 times the size of London’s Trafalgar Square and will service around 60 million passengers a year, twice the number that travel on Spain’s AVE lines in the course of a year.